Today was out biannual company leadership meeting and the guest speaker was Richard Branson. He basically did a QA with our CEO Richard Anderson. When I found out Branson was coming I started writing questions down. F-1, music, the airline and Virgin Galactic. I settled on a question about Galactic and his ten year plan. I was lucky enough to be one of three people out of 1500 in attendance to get to ask a question. His response was that he will be flying in Spaceship 2 by the end of the year, they should have reusable engines in a year or so, they are developing point to point systems and want to be able to go transatlantic and finally he wants to be orbital, have the ability to launch small telecom satiates as well as make pleasure flights and have a hotel in orbit "in the vicinity of the moon" within 10 years. It's a stretch, but you have to have dreams. It was cool to hear his story and was interesting to see him with our CEO who an interesting, but very different person. 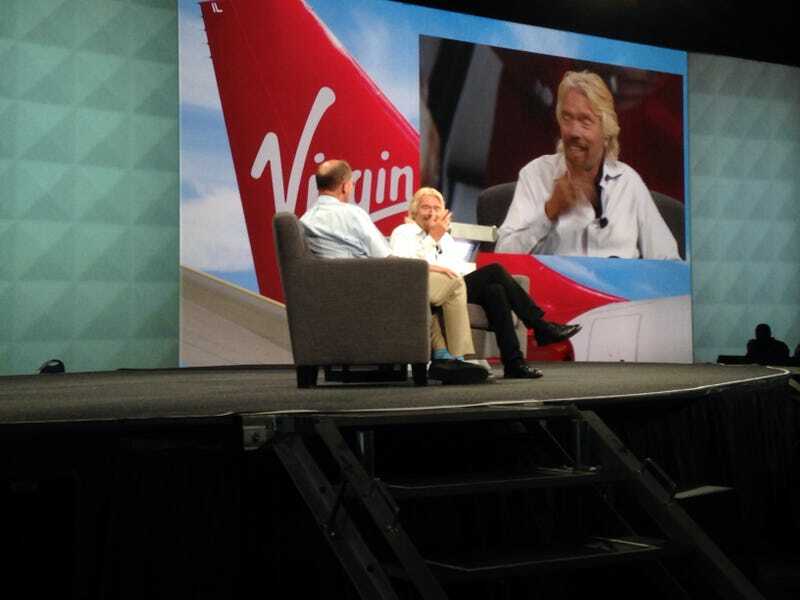 Branson also went on a 5 minute tangent in the middle of the conversation with our CEO about his opinion that pot should be legal. That was pretty entertaining! He came off stage right by us at the end and gave me a "cheers" as he walked by. As you can see I like to sit up front at these things. I always have. Sorry about the phone pics.